Commanded a brigade at First Manassas and later succeeded McClellan as the head of the Army of the Potomac. He was removed by Lincoln after Fredericksburg. 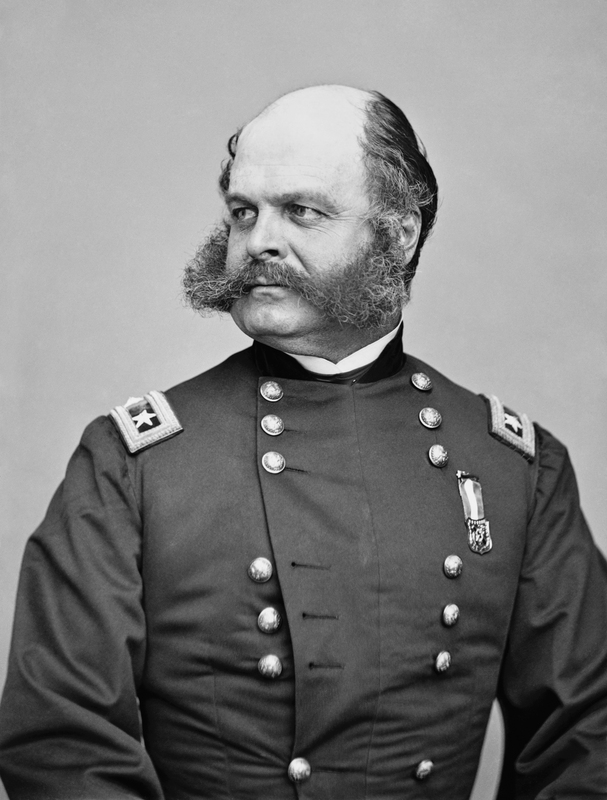 Ambrose Burnside generally knew his limits, but despite that was promoted beyond his capability. He was born in Indiana, went to seminary for a while, then West Point (class of 1847) and served in Mexico. He saw no action, only garrison duty. Against the Indians it was different: he was wounded in 1849 in the New Mexico Territory. He resigned in 1853 to make his fortune by inventing a breech-loading carbine. The Army wouldn't buy it and he went bankrupt trying. (His creditors had to be happy with the patent, which made them millions during the Civil War, when the Army was happy to have the gun.) He moved to Illinois and became treasurer of the Illinois Central. He dropped that in 1861, raising and becoming Colonel of the 1st Rhode Island. He was acting as brigade commander at First Manassas, and didn't show much insight, leading a series of piecemeal attacks rather than concentrating for an overwhelming one in the important early stages of the battle. He and his men were mustered out in August 1861 (their enlistments had run out) but four days later he was a Brigadier General and in charge of an independent force. Burnside was in charge of the North Carolina expedition, and grabbed (against light opposition) bases on Roanoke Island, and the port of New Bern. He wasn't brilliant, and there wasn't the strength to press inland, but he certainly helped the Union blockade. Success anywhere, anyhow, was enough for promotion and he pinned up his second star, and Lincoln offered him command of the Army of the Potomac. Burnside wisely declined, letting John Pope have a turn. When Pope proved incompetent, Lincoln made Burnside the same offer, but it was again declined. Instead Burnside was given oversight of two Corps (I and IX) during the Antietam campaign. At the actual battle they were on opposite ends of the Union line, and he stationed himself with IX Corps, which made slow progress crossing the Antietam Creek. Burnside, the professional soldier, saw a bridge and apparently assumed the creek was to deep to ford. Successive attacks across the bridge failed, while he could simply have pushed across the stream and flanked the few Confederate defenders. (He also detached men from the main effort, scattering his forces.) He finally cleared the bridge and seemed to be pushing through into Lee's rear, unopposed, but he'd waited too long. A.P. Hill's Light Division slammed into Burnside's flank and sent the Union troops reeling. With McClellan removed after the battle, Lincoln told Burnside to take command. He was still hesitant but felt he could not refuse an order. He stole a march on Lee and attacked Fredericksburg, again after delays actually crossing the river. The delays meant Lee could concentrate, and the Army of the Potomac paid heavily for it, in their most one-sided defeat. Having tricked Lee once in December 1862, Burnside tried it again in January 1863. This time it turned into the "Mud March" and Lee hardly needed to respond while Union soldiers drowned in mud. Burnside was sacked after saying he wanted out and also wanted a batch of officers court-martialed.